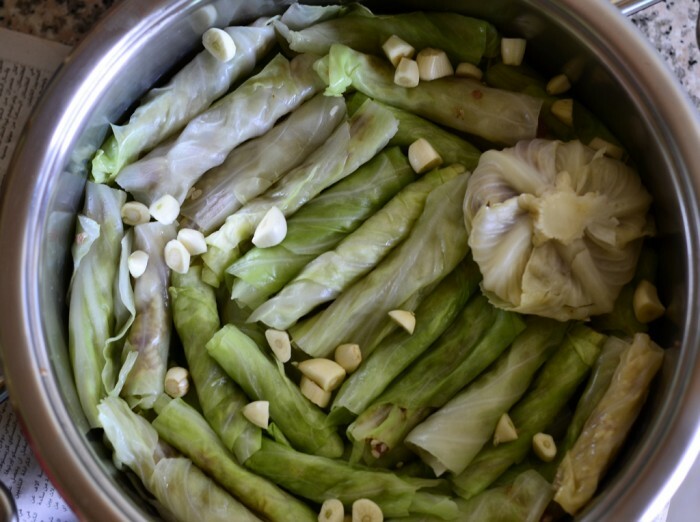 Stuffing different kind of vegetables, including vegetable leaves, with rice and meat is a distinctive characteristic of East Mediterranean cuisines. Tens or maybe hundreds of various dishes are based on this same concept.. We have stuffed peppers, stuffed zucchini, stuffed eggplants, stuffed tomatoes, onions, potatoes, grape leaves, cucumber, carrots and much more! Actually I can’t think of any type of vegetable leaves that hasn’t been stuffed, wrapped, rolled in a way or another. 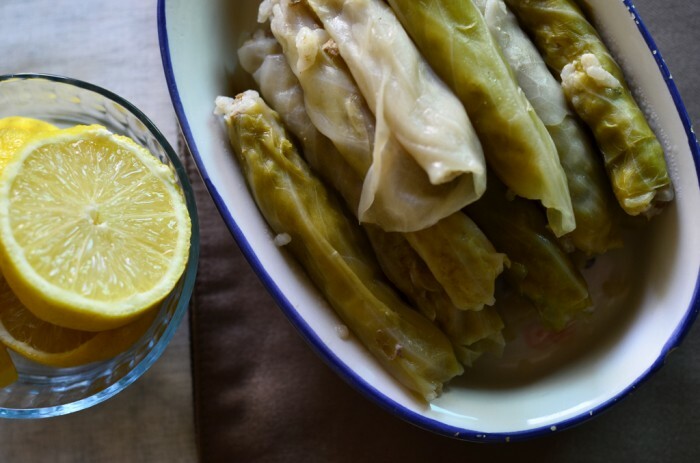 Stuffed cabbage rolls (malfouf or mahshi malfouf) is not only one of these dishes, it is one of the most flavored and delicious options among them all. At least from my taste buds point of view. 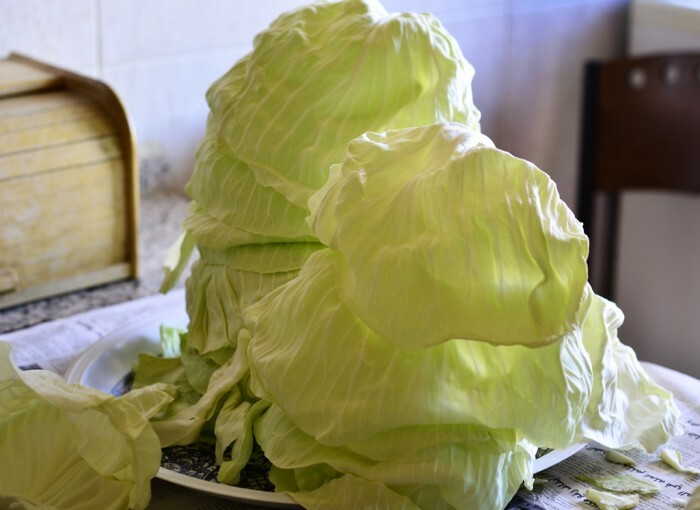 The Arabic name of cabbage is “malfouf”, however this word originally means wrapped up and that explains where the name of cabbage comes from. 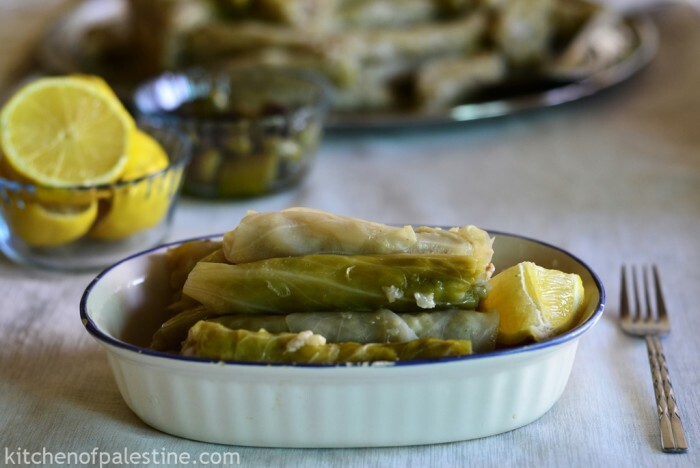 The recipe that I am sharing today is the typical and original Palestinian way of making stuffed cabbage rolls. It is easy, simple and delicious. 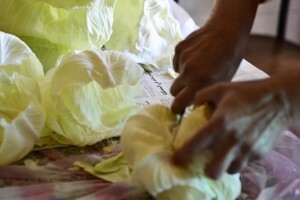 Remove damaged outer leaves from the cabbage. 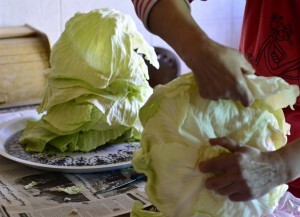 Using long knife, cut the core off of the cabbage head (in order to ease the peeling process). 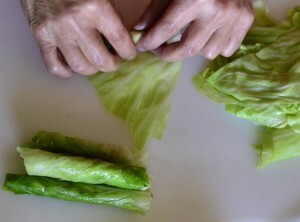 Carefully, peel away cabbage leaves one by one. 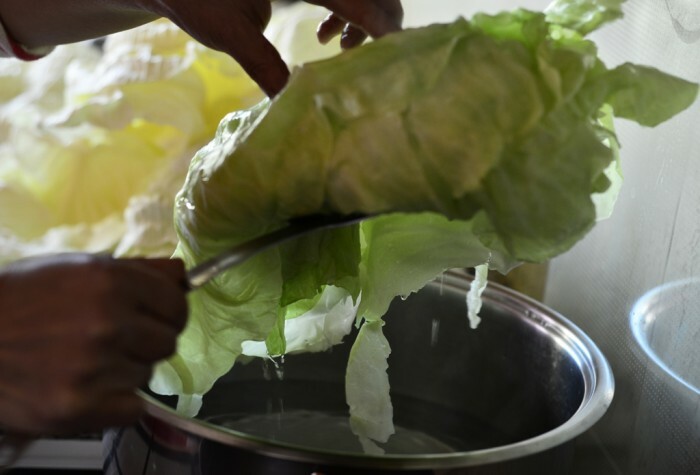 Place cabbage leaves in a deep pot of boiling water (divide them into batches). Keep them in the boiling water under medium heat for about 2 minutes, then flip the batch of leaves over and leave them for another 2 minutes until they become tender. Set them aside to let drain. 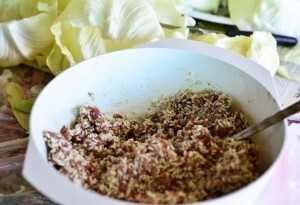 For stuffing: in a bowl, add rinsed rice, meat, cumin, allspices, 1 tablespoon salt, and vegetable oil. Mix altogether until well combined. For rolling process: cut each cabbage leaf into about 10 cm X 15 cm sheets (that may take different shapes according to the leaf shape). 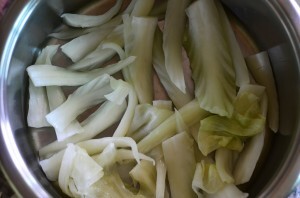 Cut off large stalks of each leaf and place them in the bottom of a large cooking pot. Place each sheet on a smooth surface. Add about one tablespoon of stuffing to each sheet and then spread it across the sheet leaving some space in the edges. Roll sheet forward toward stuffing (it’s okay to leave the roll edges open). Squeeze the roll using your hand and place it in the pot. Repeat for each sheet until you fill half of the pot. Add half quantity of the chopped garlic. 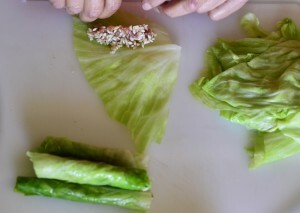 Continue to layer up the pot with cabbage rolls. 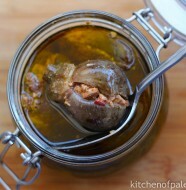 Add the remaining amount of garlic, 1 tablespoon of salt, and cube of stock. 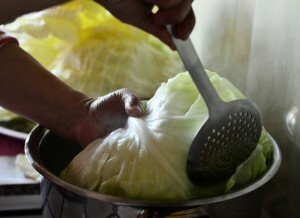 Cover cabbage rolls by water (same level of the rolls) and place the pot over a medium heat until water is boiling. Cover the pot, reduce the heat to the minimum and let simmer for about 45 minutes until the rice is fully cooked. Add lemon juice 15 minutes before cooking time is up. Serve hot with extra lemon chunks. Note: to enjoy the full flavor and moisture of stuffed cabbage rolls, flip the pot over onto a large serving plate. 33 Comments on "Stuffed Cabbage Rolls (Malfouf)"
I know not many might like it this way but I love it with Yogurt aside!… NUM NUM :). Recipe’s greatness aside, I am in love with the photos of this post! Such a comment from a photographer is a true compliment. Thank you! 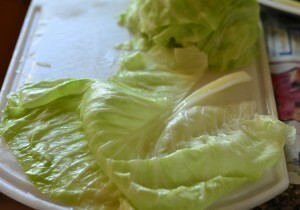 It was quite fiddly to get the leaves separated without breaking them, but all in all, it was simple yet delicious. I’m glad that the recipe turned out well and you both liked it.. Pass my salam to Emad! Thank you Shannon for stopping by.. As for mahashi, I’ll make sure to take some pictures and post the recipe next time mom cooks it.. 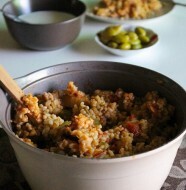 Typically short-grain rice is used in stuffing malfouf and other vegetables in general. I recall that my neighbor tried it once with brown rice and it was good but not compared with short-grain white rice. So it works with almost same cooking time but you need to soak it in water overnight. Hi I just wanted to thank you and your family for this great recipes I grow up eating them when I was a child and when my grand mother passed away I though all this recipes where gone I’m so exited ! for many many years I’ve been craving them. i just made it,thank you for this nice reciepe.it was very delicious and easy to make. IS the poster arab, ive been trying to find a vegetarian option for this,cause I dont eat meat. Malfouf is meant to be fatty, that’s why we use lamb meat. I’ve never tried the vegetarian version of it. But I would imagine it without meat and meat spices, and with herbs like cilantro, basil and extra lemon juice. HI, Re Asma: I would try pinenuts fried in butter, or alternatively fried and seasoned quorn, or porcini mushrooms. In the latter case you might want to add some finely diced pickled veggie. Vary with the herbs to find the best combination; I sometimes put in a tiny bit of mint for variation, but that is with the meat version. Hi … just i want to thank you Eman !! Allspice is a dried fruit of some tree. It’s an ingredient used in many Palestinian dishes. If it’s not available where you live, you can use a mix of cinnamon, black pepper, and ground cloves as an substitute (cloves can be optional). 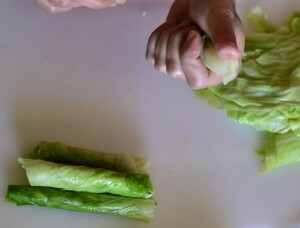 I am a Jordanian, i have never seen it cooked this way where the cabbage is peeled away before actually boiling it..The way we do it is we leave the core and slit around the core five ways with a knife whole.. we than put it in the boiling water and the leaves start to roll off easier , and as this happens we start collecting the leaves as they soften and put in a large pan to get ready with the stuffing process. Finally we use the small little inside ball call the djaj and we peel the leaves apart but holding to the core and we stuff this also.. Its is most tender!!!! 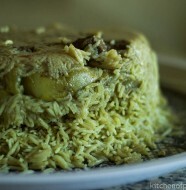 I just finished making the malfouf and it turned out delicious..thank you so much tasted just like my mother’s!! I love this dish!! First ate it in Kuwait and it was delicious!! Once we came back to the u s I found your recipe and made it for my husband at home. He was so surprised and impressed that he had to call his sisters in Gaza and brag about my dinner lol alhumdulilla :) I did find that it was easier to remove the leaves if you boil the entire head of cabbage (whole) for about 5 minutes first. They don’t break easily that way. I received many comments explaining how boiling the head of cabbage would make the process much easier. Thank you Sameha for your comment and Ramadan Kareem.. I have tried malfoul many times but never did it myself. Ekhteerr Zakyh! I already know the recipe because i am originally palestinian and have learn it from home! But this website is very good for palestinian recipes! Very accurate and delicious. Mash’allah! I like better the one without meat. My Palestinian friend used to make it. Can you please tell me what spices to put with the rice? Hi all. I lived and worked in Amman for 18 months. And had this wonderful dish at both Muslim and Christian homes. My “adopted” families served Malouf with a side dish of the tomato/lemony broth and a separate dish of yoghurt. Brings back memories. For first time will try to make this dish. Home cooking is best. Greetings from Australia. Excellent recipe tasted exactly like my mom’s.